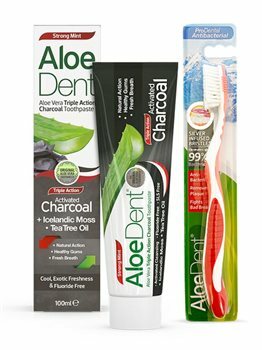 We've added some of natures most trusted ingredients including Aloe Vera, Activated Charcoal, Icelandic Moss and Tea Tree which help protect your teeth. You can be sure that you are getting all the benefits of a fluoride-free toothpaste, rich in natural ingredients that really work, every time you brush. Aloe Vera - Helps sooth gums. Charcoal - Naturally whitens & removes impurities. Tea Tree Oil - Natural antiseptic. Silica - For natural whitening. Icelandic Moss - For natural whitening. Glycerin, Aloe Barbadensis Leaf Juice, Sorbitol, Hydrated Silica, Aqua, Sodium Lauroyl Sarcosinate, Mentha Piperita (Peppermint) Oil, Cetraria islandica (Icelandic Moss) Extract, Hydroxyethylcellulose, Menthol, Xylitol, Stevia Rebaudiana (Stevia) Extract, Melaleuca Alterniflia (Tea Tree) Leaf Oil, Escin (Horse Chestnut), Phenoxyethanol, Sodium Benzoate, Potasiium Sorbate, Citric Acid, Charcoal Powder (Activated), Benzyl Alcohol*, Limonene**.